Above, about 50 participants take off from the Fortin Center at Rocky Mountain College on Saturday as they take part in a virtual run to honor missing Sidney teacher Sherry Arnold. At top, the racing bib could be printed from a blog started by Arnold’s cousin, Beth Risdon of Longmont., Colo.
Shelly Popp, left, and Tammy Dynneson wear Sidney High hats as they walk in a virtual run held in honor of missing Sidney teacher Sherry Arnold Saturday. Hope Barker, a Rocky Mountain College cheerleader and former student of Sherry Arnold, leads a group of participants at the start of the Sherry Arnold virtual run event at the Billings college Saturday. Brooke La Forge, 12, right, runs with her grandmother, Rita Kunkel, center, and friend Lynette Cross down Shiloh Road towards a finish at Montana Cycling and Ski as part of a virtual run to honor missing Sidney teacher Sherry Arnold Saturday. Participants gather at Rocky Mountain College Saturday morning for a run to honor Sherry Arnold, a Sidney teacher who is believed to have been abducted Jan. 7 while she was on a morning run. Virtual runs were held across the region in an event conceived by Beth Risdon, Arnold's cousin, who lives in Colorado. Hope Barker, a Sidney native who had Arnold as a teacher, proposed the idea for the Rocky run. Other Billings events were held at Montana Cycling and Ski at Shiloh Crossing shopping center and at Fitness 19. Bracelets in honor of Sherry Arnold for sale at a virtual run in the Sidney teacher’s honor Saturday. Runners wore special race bibs to honor Sherry Arnold during a virtual run in support of the missing Sidney teacher Saturday. Hope Barker, center, runs with friends Kaylee Guerin, left, and Brianna Bauer during the virtual run in honor of Sherry Arnold on Saturday. a virtual run for Sherry Arnold Saturday. As Hope Barker got ready to take part in a virtual run Saturday in Billings to remember Sherry Arnold, she recalled the impact her former teacher had on her. "She was the type of person where it didn't matter what time of day it was, it didn't matter if she was busy, if you needed help, she was there for you," said Barker, 20, a sophomore at Rocky Mountain College. Arnold, 43, a Sidney High math teacher and avid runner, is thought to have been abducted Jan. 7 while on a morning run. Officials believe she is dead, although her body has not been found. Saturday's virtual run was organized by Arnold's cousin Beth Risdon of Longmont, Colo., as a way to honor Arnold's memory. Runs took place around Montana, the United States and even in other parts of the world. In Sidney, nearly 500 people participated in a run at Sidney High. Locally, at least three runs were held in Billings and Laurel. 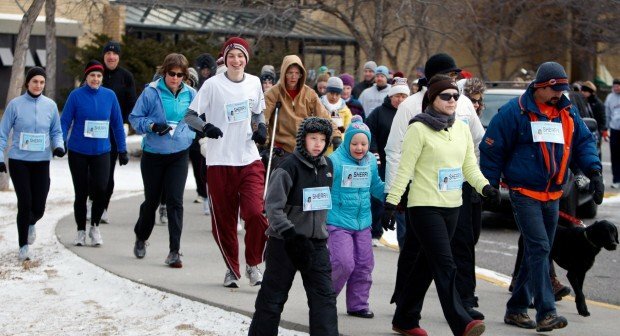 As temperatures hovered just above zero at 9 a.m., 50 people ran or walked at the virtual run at Rocky Mountain College organized by Barker and Rocky associate math professor Robyn Cummings. All of the participants wore racing bibs that featured Arnold's picture and name. The event started with quiet reflection. "If we could all just take a moment of silence and think about why we're here today and how we've been touched by Sherry Arnold and what she meant to all of us," Cummings said. Barker is a Sidney native. Since she couldn't be in the small northeastern Montana town for the run, she decided to put one on in Billings. "Rocky is a very close-knit school, so I figured that it'd be a good place to do it because they're all about community and small-town things like this," she said. Barker, who had Arnold as a teacher her junior year of high school, called Arnold "an amazing person." "I got really close to her just being in class because she didn't just help me with math, she helped me with a lot of my other classes and just stuff going around in school," Barker said. Cummings, a runner and a math teacher like Arnold, said she hoped the event would spur people to follow the example set by Arnold in her life. "We should try and think of how we can turn a tragic event into something positive, so each of us could do something in her honor to make our world better," Cummings said. She and Barker have talked about turning the run into an annual event to benefit others. Tammy Dynneson, a Sidney resident, happened to be in Billings on Saturday and decided to join in the Rocky run. Arnold taught her two daughters in high school, said Dynneson, who said Arnold "had a heart of gold." "She's a wonderful teacher, she's a great mentor to the kids, she's got a personal relationship with the parents," Dynneson said. "On just a day-to-day basis she just cared about everything she was involved in." In West Billings, another 30 runners ran 3 or 6 miles in a run organized by Montana Cycling and Ski. Long-time runner Carla Hager, who completed the 3-mile run, said she hit the pavement to "honor someone that I shared a common bond with that I never knew." Hager grew emotional as she talked about Arnold, a fellow member of the running community, which Hager called very strong. She identified with Arnold's love of the sport. "There's nothing like being a runner, you always have that bond with other runners and the drive to put your shoes on every day and tie them up and put your coat on and get out there and go," Hager said. Taking part in Saturday's event was also a way to acknowledged everything good about Arnold, Hager said. "Her running, her strength, her spirit; she's a mom, she's a wife, she's a teacher, she was active in her community, she was a role model for her students and probably the running community in her small little town of Sidney," Hager said. She called Arnold's death a sobering reminder of what can happen on the road. "She wasn't doing anything different than any of the rest of us do every day," Hager said. "She was in the wrong place at the wrong time." Kayla Brown, who works at the cycling shop, helped organize the West End event. She thought that without a formal event, many of the participants would have gone out on a run on their own in honor of Arnold. "But it's always nice to run with people, and it's nice to remember (Arnold) at the same time, so that's why we did it," Brown said. Risdon, the organizer, took part in a virtual run in Longmont Saturday morning that drew 50 to 75 people, despite the snowy, zero-degree weather. Nearby Denver had between 100 and 200 runners, she said. In a telephone interview Saturday afternoon, Risdon said she met Arnold, her cousin once-removed, when the two were 10. "We connected a lot on the running thing, where we would trade emails about running and training," Risdon said. "I knew that was a real passion for her." When Arnold first disappeared, Risdon thought about organizing a run to get some positive energy moving for her safe return. "Then, when we found out she wasn't coming home, there continued to be this sorrow out there and people wanting to connect around the story, wanting to do something," she said. So through her online blog, Risdon put out the idea of a virtual run, where people could print out the racing bib with Arnold's picture on it, and walk or run in her memory. It was a way, Risdon said, to "put some positive energy forward into sort of the goodness of human nature rather than focusing on the terrible thing." Thanks to the strong tie among runners and the power of social media, the word started spreading not only in Colorado and Montana, but far beyond. In the last week or two, Risdon received hundreds of emails from people around the world. On Saturday alone, she got at least 200 emails containing photos of group and solo runs that had taken place that day. They came from as far away as Switzerland, Cyprus and Hungary. "I know people were running on all the continents," she said. Risdon said Arnold's family is in awe and humbled by the enormous response the run has engendered. She thinks Sherry Arnold would have felt the same. "I think she would have thought it was very overwhelming that all these people are out there for her," Risdon said. "I think she would have been honored, truly." To see photos and video accounts from other races, click the link in this story at billingsgazette.com.